Butcher's Broom is a shrubby, evergreen plant, which may be found in woodlands but also on waste ground, particularly in the South of the U.K. It is tolerant of deep shade, and can also survive in coastal areas (where salt spray is a problem to many plants). It is sometimes known as Knee Holly, due to its prickly, evergreen leaves – which are like those of holly plus it often grows to about knee height (but it is in no way related to the true Holly, as it is a member of the Lily family). It is very different in appearance to other liliaceous plants, many of which form bulbs and have parallel-veined leaves (e.g. Lily of the valley, Asparagus, Solomon’s Seal). 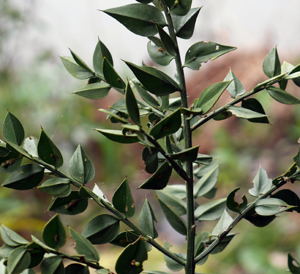 Butcher’s broom (or Ruscus aculeatus) is the only liliaceous shrub known in this country. Other 'common names' for this shrub are are box holly, knee holm, knee hull, pettigree, pettigrue, prickly box, shepherd's myrtle and wild myrtle. Mature branches of the shrub used to be bound into bundles and sold to butchers for cleaning their blocks, hence the name - Butcher's Broom. The shrub has green, erect and striated stems (i.e.the stems have lines or small ridges running along them - see adjacent image). 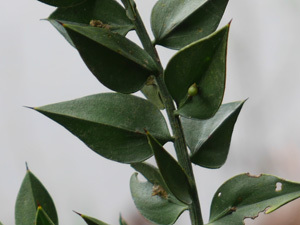 The stems send out short branches, which bear many pointed ‘leaves’. These ‘leaves’ are actually flat (modified) shoots, known as cladodes. They have the appearance of stiff, spine-tipped leaves. Each cladode / ‘leaf’ ends in a single sharp spine. In Spring, small greenish-white, 6 petalled flowers appear on the cladodes or ‘leaves’. The flowers form in the centre of the ‘leaves’ (cladodes or modified stems). A single flower forms on each ‘leaf’ surrounded by tiny (papery) bracts (which are the modified leaves). Butcher’s broom is dioecious, that is, male and female flowers are on different plants, as is often the case with Holly and Mistletoe. Female flowers, if pollinated and fertilised, produce a red berry (about the size of a small cherry) in September. This contains seeds that are distributed by birds. However, the plant can also spread vegetatively (asexually) by means of rhizomes. The roots / rhizomes have been used by herbalists for many years for a variety of conditions. The active ingredients are steroidal saponins - compounds called ruscogenin and neoruscogenin, though a variety of other chemicals can be found in the plant's tissue (coumarins, sterols, triterpenes etc). 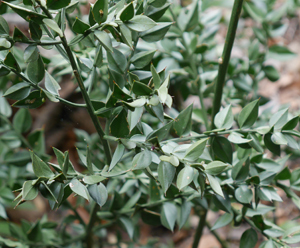 Some studies have indicated that Butcher's Broom may be useful in the treatment of oedema (fluid retention by the tissues), and possibly the treatment of orthostatic / postural hypotension - a dizzy spell on standing up. Further evaluation is needed, partly to determine interactions with prescribed medications. 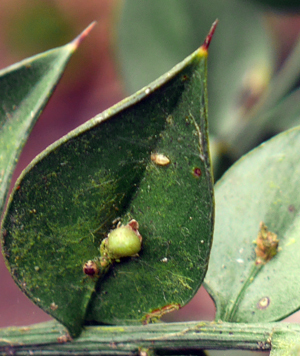 Holly – a fodder crop!